In an interview with the fifth estate's Mark Kelley, France's far-right National Front leader says Canada is playing with danger by potentially allowing militants to slip through as refugees. Marine Le Pen, the controversial leader of France's far-right National Front, is scoffing at Canada's plan to welcome 25,000 Syrian refugees with open arms, calling it "madness." "There. I've said it. Madness," she said in an interview with the fifth estate. "There are other ways to do it," she went on, adding that the "danger is real — false passports. "A real passport given to Islamic fundamentalist in the influx of immigrants to enter the country with the intent to commit terrorist attacks. It's a danger. And that's what happened in Paris," she claimed. Le Pen — roundly criticized by many in France for what are seen as thinly-veiled racist positions — sat down with the fifth estate's Mark Kelley as part of a special report that airs tonight called "Aftermath: How Paris Changed the World." Le Pen is currently doing well in French public opinion polls, particularly in two regions in the southeast and the depressed north, where she is vying to be president of the area called Nord-Pas de Calais in regional elections set for early December. Le Pen and her party appear to have received a boost by voter concerns about security after the attacks in Paris on Nov. 13. But her anti-immigrant stand worries many French voters, and France's situation when it comes to immigration, multiculturalism and Muslim asylum seekers in particular is much different than Canada's. France has one of the largest Muslim populations on the continent already, one that has felt marginalized and excluded from employment and education opportunities and has been the scapegoat of the far right, including the National Front and its supporters. "I speak French better than maybe some French people," El Jazouli said. "I really try to make my country better. But for the Le Pens, it is not enough, because I'm not white." 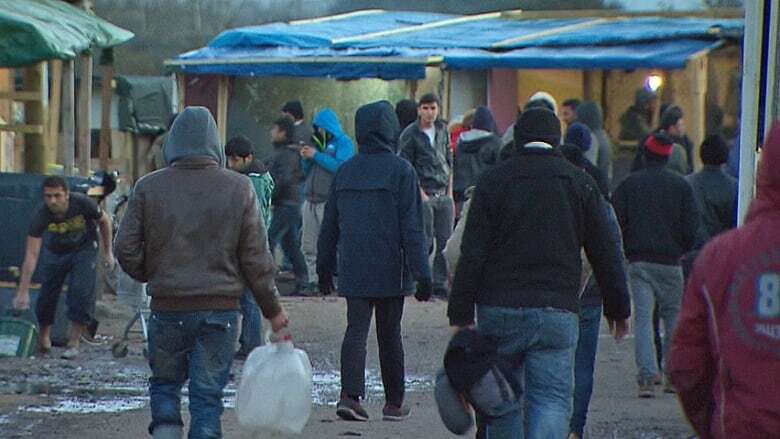 El Jazouli said that when Le Pen targets migrants living in what is known here in Calais as "the jungle," a large refugee camp, he feels she is also targeting people like him. But he says he refuses to think most French people are like Le Pen. "I see in my neighbourhood, my neighbour and all the people they love me and I love them," El Jazouli said. "Because we are French citizens." Le Pen said her solution to the migrant crisis is to kick them out and seal the borders. 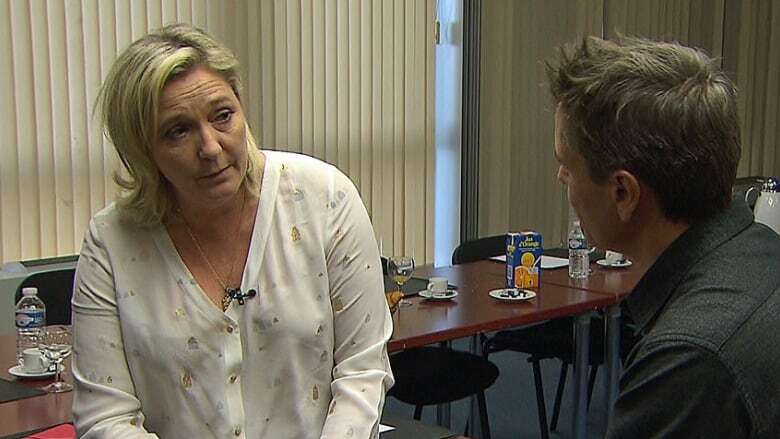 "The influx of migrants must be stopped," Le Pen told the fifth estate. "We know Islamic fundamentalists have infiltrated this flux of migrants to slip by unnoticed." In the refugee camps, Le Pen's campaign of fear is unsettling those who have made it this far. They are afraid that after getting so close to their destination — for most here that would be England — they may soon be kicked out of France. Alex Limousin is an aid worker in the Calais camp. She knows that keeping migrants in the camp isn't a solution, but she also says that Le Pen's solution of kicking migrants out isn't the answer, either. "Yeah, but where? Send them home? You can't send them home when there is bombing, like in Syria and Iraq," Limousin said. "Send them home, we are just bombing them. How do you want to send them home? Say, go back to your country because we don't want you here? I don't think it's a solution." Experts say posing as a refugee would be an inefficient way for a person to enter Canada due to the many security screenings required to be granted asylum. The United Nations Refugee Agency interviews individual asylum applicants, and flags about two per cent of them for resettlement. Canada has sent 500 officials overseas who individually interview those asylum applicants flagged to them by the UN before they can travel to Canada. Both the UN and Canada's screening processes include questions about the person's travel history and whether or not they have been part of a military, militia or other armed group. Biometric data is also collected. "If you're planning an attack, particularly a major co-ordinated attack abroad, the last thing you're going to do is count on one of your attackers getting through the refugee and migrant streams," security expert Wesley Wark said in a recent interview with CBC. By contrast, France does not have a plan similar to Canada's. European Union leaders continue to argue over what to do with the more than 700,000 people who have come to the 28-nation bloc seeking sanctuary or jobs so far this year.